As the 2014-15 season continues to roll forward full steam ahead, it seems unreal to come to the realization that we are nearly 20% through the gruelling 82 game regular season already. It is at this point of the season that looking at possible Playoff teams, Hart Trophy candidates, and Vezina candidates begins to be more of a realistic look into the crystal ball, instead of a ballpark guess. For today, let us take a look as some of the greatest goal scorers in the NHL today. These guys are naturals at being in the right place at the right time, finding holes through screens, and using the perfect release to throw off opposing goaltenders by just a fraction of a second, enough to have the puck find mesh instead of being on the wrong side of a highlight reel. It is almost a certainty that one of the following players will find themselves posing with the Rocket Richard Trophy in Las Vegas next June. Here, we look at five players who just missed the cut for the Top Three in the league. These players wouldn’t be favourites the win the gaol scoring race in many fantasy leagues, but they are a lock to near the 40 goal plateau in April of 2015. Phil Kessel is a lock for around 40 goals a year at just age 27. Acquired from the Boston Bruins in exchange for the following player, Kessel has undergone the expected criticism of any player who plays in the crazy, hockey mad, Toronto area. However, now at 27 years old and in his sixth season in the Blue and White, Kessel seems to have found his groove. In the past five years, he has missed just 12 games and has averaged 35 goals per year. Imagine how his totals would jump if he had a real first line playmaking center to set him up. He’s known to be a ridiculously streaky scorer, but he’s on pace for 44 right now and may crack 40 for the first time in his career. He uses an intermediate stick with an uncanny flex which allows him to have one of the sneakiest releases in the entire league. It’s hard to pick up on and he knows very well when to use it. Acquired as a draft pick from the Toronto Maple Leafs, Sequin won a Stanley Cup in his first season at just 19 years young. After some skepticism in Boston and the team looking in a slightly new direction, he was traded to the Dallas Stars two offseasons ago. After setting career highs in goals, assists and points last year, he is off to a torrid start to 2014-15 again. Already on pace for 58 goals, many would predict Seguin to slow down a bit as the season wears on. Those people would likely be right, but there most definitely is the potential for Sequin to explode this year, playing alongside Jamie Benn and Jason Spezza, anything is possible. You’ve got to remember, he was drafted just four years ago. Last year, he was fourth in the league in points. He could easily be second this year and push for a Rocket Richard Trophy. Just last Saturday, Seguin showed why he’s one of the best. One of the lesser known top scorers in the NHL, Pacioretty is beginning to come into his own. Still developing, he has 33 and 39 goals in the last two full seasons, respectively. Off to a bit of a slower start than expected, he is still on pace for 33 and could easily push that number up near 40 again this year. Do not let the fact that he isn’t talked about in the calibre as some of the guys fool you, or he will beat you single handedly. As the Habs climb out of their current slump, so will Pacioretty’s goal totals, because when he scores, Montreal usually wins. There’s no doubt he’ll dust himself off and find his stride soon. 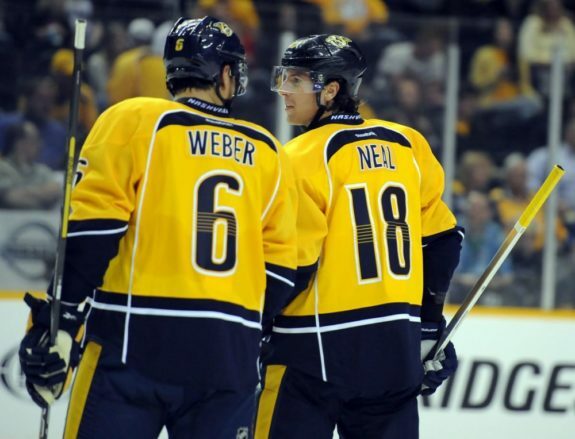 When he was traded from the Pittsburgh Penguins to the Nashville Predators on Draft Day of 2014, everyone expected Neal’s totals to fall off a cliff with the usually defensive minded Preds. However, with Peter Laviolette as ew head coach, and Neal’s insane natural talents, he’s gotten off to a hot start in 2014-15. He’s scored at least 20 goals in every year in his career and is on pace for a career high in goals this year. In Pittsburgh, people skeptisized that he only scored because he was playing with Malkin and/or Crosby. This year, he’s out to prove the critics wrong and show that it was his own natural abilities. So far, so good. James Neal finds himself in a different shade of yellow this year, but it hasn’t slowed down his goal scoring yet. Yes, the best player in the world is also one of the best goal scorers in the world too. Known mostly for his overall point totals, his scoring abilities sometimes go forgotten. When he finally got over post concussion issues, he came back and put up a pro rated 128 points in the lockout shortened season. But we’re talking about goals. In the season before his concussion, Crosby scored 51, so yes, he can find the back of the net himself too. Certainly more of a playmaker, Crosby has one of the quickest releases in the game and can get it off accurately, although not nearly as hard as some others. Regardless, Crosby will certainly be near 40 goals. Oh yea, and he might be a little bit clutch in big moments too. Now for the big three. These are the guys you can expect to be near the top in goals scored each and every year. In fact, you would be very smart to bet on one of these three to come out as the Rocket Richard Winner in 2014-15. Corey Perry is off to a good start. Actually, he is of to a sizzling start, perhaps even a scorching hot start. Any word you want to use for amazing is just fine in this case. Through almost 20% of the season, Perry is on pace for an u heard of 69 goals. And, although its highly unrealistic for him to continue at this level of play, he has keep it up for a fair amount of the year. Everyone knows he can score as he’s hit the 40-goal plateau twice, even scoring 50 in 2010-11. And at 29 years of age, Perry should be in the prime of his career. So it wouldn’t be unbelievable to say he could set a career high this year. The fact that he plays alongside Ryan Getzlaf, one of the best playmaker’s in the NHL, definitely helps his case as well. Also, Ryan Kesler playing behind him gives their line a significant break this year. So, is 69 goals possible for Perry in 2014-15? Not likely, but 50 is certainly a very attainable goal for the Ducks winger. Take a look at his insane ability to somehow always find the back of the net. Although he is off to a much slower start than expected, do not think he is having a bad season. With a 9.2 shooting percentage so far, you can expect that number to slowly creep up near 12%. He’s also scored over 50 goals five times in his career, so it’s doubtful that he’ll suddenly have a low season like 35 goals. He’s also won the past two Rocket Richard Trophies, so who’s to say he won’t win a third in a row? Ovechkin is another player who highly benefits from player with one of the top playmakers in the league, in Nicklas Backstrom. There are legitimately no reasons to think Ovechkin won’t be near the top in goals again this year. Another reason for hope is that, like Corey Perry, he is 29 years old and likely in the prime of his career.Look more towards mid 40’s for 2014-15. Check out Ovehkin showing off against Stamkos and company last year. The best goal scorer in the league goes to Steven Stamkos. One thing you’ve got to remember following his injury plagued 2013-14 season is that, before last year he had missed 0 games in the past four years. He is not prone to injury. In the lockout shortened season, he was on pace for 50 goals. In his 37 games last season, he was on pace for 55 goals. After his rookie season, the least amount of goals he has ever scored was 45. Something insane to remember about Stamkos, is that he is only 24 years young. His pace of 55 goals is definitely a fair prediction, heck it might even be low! Another thing to consider for Stamkos’ future is that he will very likely play with upcoming superstar, Jonathan Drouin. He is expected dot be a top playmaker in the league and, right now, is on a 50 assist rat in his rookie season. So, it’s very safe to say, almost certain, that Steven Stamkos will challenge for, if not win, the Rocket Richard Trophy for many, many years to come. Here’s all 60 goals by Stamkos in ’10-11. Disagree with the Top 3? Who do you think deserves a spot? Feel free to discuss in the comments!